Crossover Health | Four Ways to Get Moving! Four Ways to Get Moving! 10 Apr Four Ways to Get Moving! “We like to move it, move it.” At Crossover Health, we want you to MOVE. We want you to move without fear, with less pain or limitations and move the best that you can (and maybe dance a little too). Our Physical Medicine team has your back. 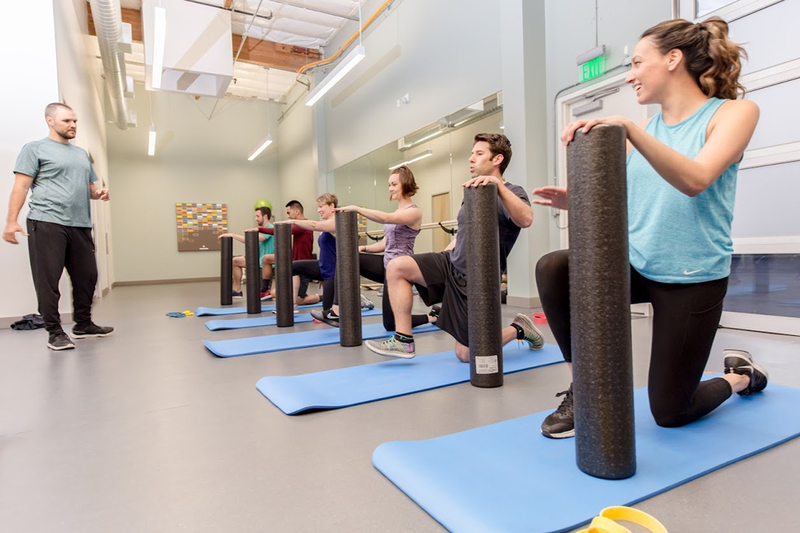 The Crossover physical medicine (PM) team includes specialists in the areas of physical therapy, chiropractic, acupuncture, massage therapy, and certified functional movement for strengthening and conditioning. What’s more, our PM team is part of a larger integrated team of primary care, behavioral health and coaching experts. Every one of these professionals has a passion for motivating members to be well and enjoy life. We provide private appointments with our care team and group educational classes lead by our licensed movement specialists. These sessions (one-hour max!) are currently held at our beautiful health centers or can be scheduled on your campus for workshops and employee meetings. In both of our movement classes, we will look at the structures that make up our posture and progress through a simple office and home movements that encourage every-hour-on-the-hour movement! You can expect a group led-session that is active and personalized with a slide deck to follow and handouts to take home. We will demonstrate how to move correctly and how it affects your body. Posture Hacks Class: We will go over the why’s and how’s of good posture that takes you into the correct movement patterns to support and sustain a strong spine. Prevent neck and lower back pain with proper ergonomics and stretching to address your lifestyle. Move Better Workshop: A licensed expert will take you through some of the basic positions and movements and make them even more dynamic with the outcome of safely improving function! This is a chance to prepare for more high-intensity exercises and fit school training while ensuring safety and strength. Drop-in Classes: Each class is kept to a maximum of ten participants so that you’ll get the benefits of a semi-private training session while sweating it out with a group of people who will keep you motivated. We believe that those who sweat together stay together! And the best part? This is a smart way to get into fitness that is affordable, close by, and in our clean, modern centers. Personal Training: A Certified Functional Strength Coach will create a personal program tailored to your needs and goals, one on one. Personal training is a great starting point if you are beginning or getting back into an exercise program as well as returning from an injury. All of our coaches work alongside our medical team to ensure you get the care and attention you deserve while tracking your biomarkers such as BMI, blood pressure, A1c, and strength. Our goal at Crossover Health Physical Medicine is to get you moving well and keep you moving well with our entire team to support you. About the Author: Kristin Seaburg works at Crossover Health and holds a degree in Sports Medicine and a Doctorate in Physical Therapy. She has worked as an athletic trainer for youth to professional athletes and loves to encourage people to move in whatever capacity they feel comfortable and then challenge them to move a little bit more. Kristin is proficient in the Spanish language and enjoys paddle boarding, cooking and making people laugh with a good healthy prank, while traveling as much as possible.